I have not been doing good with my weekly goals. I have problems with being consistent. 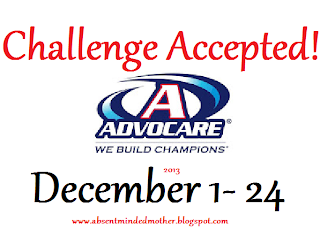 My sister has been losing weight with Advocare. It is expensive but I'm thinking that spending money will motivate me this winter. We are doing a challenge together Dec 1-24. This will be hard with the holidays and I will be going out of town at the end of the challenge. I have lost some weight with not eating bread, but I usually cheat when we go out to eat so I will need to work on this. I also get sick of chicken and fish all the time, but it's only 24 days. My plan is to also start doing the Bikini Body Mommy 90 day challenge, at least days 1-24. My goal is to lose 10 pounds and to be lean. I'm most nervous about Spark because it has a lot of caffeine. I tried some one day and I felt sick after. The good new is my work now has a Pepsico Micro Market with more options, like fruit if I get hungry or dont have time to make my lunch, etc.